We’re continuing to bring you great offers here at PlayStation to start off 2013 right, and our latest deal can help you take advantage of everything PlayStation Plus has to offer for the rest of the year and beyond. For a limited time, we’re giving you three extra months of Plus at no additional cost when you sign up for a one-year membership. The time to become a PlayStation Plus member couldn’t be better. We ended 2012 with the addition of PlayStation Plus and the Instant Game Collection on PS Vita, for a combined savings of $2,472 for the year. That includes free games and discounts for both PS3 and PS Vita, and we’ve got plenty more plans for PlayStation Plus in 2013. Yesterday we released our brand new Classic White PlayStation 3, which comes with a huge 500 GB hard drive (plenty of room for your Instant Game Collection). The Classic White PS3 package also comes with a voucher for one year of PlayStation Plus — if you redeem the voucher during this special promotional period, you’ll receive the bonus three months of free games, discounts and exclusive features through PlayStation Plus. And those of you who are already reaping the benefits of PlayStation Plus are in luck—you can stack your membership to take full advantage of this great offer! This deal won’t be around forever, so make sure to act quickly. 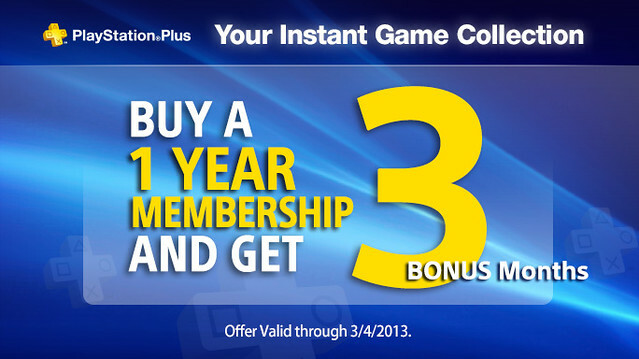 We’ll be offering the PlayStation Plus 1-year (+ 3 months) deal starting now and running through March 4th. Oh, and don’t forget to check PS.Blog later on, when we’ll have more Plus news, including a new addition to the Instant Game Collection. Agh! I just got mine last week. TIMING! LOL great deal though! Currently I’m a subscriber until 2014, how can I take advantage of that offer as well? Well, you can keep on stacking that membership if you’d like. PS Plus isn’t going anywhere. Stacking membership the the way to go! Glad that US has a Plus membership deal running. Yeah, I jumped on when they addd vita games. Still, this is why Sony is making me a bigger and bigger fan of theirs. I’ve had my LIVE account for six years and haven’t got a fraction of the incentives I’ve gotten in two months in PS+. I’m definetly resubscribing next year. So, I can buy a $50 dollar PSN Plus card from a store or from the PSN the Store and still get an extra 3 months? Just got the news that it WILL work if you buy a 1 year Plus membership at retail. As long as you redeem it anytime from now until 3/4. jummm …. so i put in the PS+ year code …. and automatically the 3 month one will pop up afterwards or are you guys gonna send a psn message afterwards with the 3 month code??? My brother already has plus, can we get this to add to our current subscription? I was gonna extend PSN Plus subscription on June, when my current subscription almost expire. Now, I’m seriously thinking to extend the subscription before 4 of March. Yeah I can’t say if this deal will come around again this year, so it may be best to hop on it now. Does this work if I use a one year ps+ card that I bought at Best Buy? Ok, so i LITERALLY purchased my yearly subscription yesterday, on the 27th. ANY chance i might get this? I hope you start off February with a bang to encourage new subscribers into signing up. I sure hope this isn’t what we get for this week’s content. If so then this tops last weeks crappy game; Fooseball 2012, oh boy. We have another update coming this morning with an addition to the Plus Instant Game Collection, and a handful of discounts. its a shame that US PS plus user s are getting crappy games for plus, especially vita users. being an owner for ps plus only for vita… its becoming less and less good to be a member… foosball… and all these chronovolt and bad games. really…. when will we get a proper game like mortal kombat or even luminess … sino mora would be good, even escape plan or rayman would be a good game…. @Morgan so if I go to my retail store and buy a year of PlayStation plus you’re going to add three months? Or do I have to buy it from PSN? Also, just confirmed that it will work if you buy the 1 year Plus at retail; as long as you redeem it by 3/4. Like most a saying already, I hope the content we are getting for Plus between now and March 4 convinces me to renew. The Vita content has been disappointing; maybe this is because there isn’t enough games on the Vita, but if that is the case, you really shouldn’t have started off with 6 great games. The expectations have been set too high. And what happen to all the free themes and avatars? @16 it clearly says that they will be updating with a new IGC addition later. I’ve been closely following updates between US and EU and it seems to have stabilized at least last month. While we only got two 2010 games (NBA Jam and Darksiders), EU only got the one 2010 game (BioShock 2). This month’s 2012 release game for EU (Sleeping Dogs) will be a hard one to top, but I’m hoping these guys will pull through since last month’s offerings were starting to get better than the usual. I’m waiting on the next post today (I’m expecting that this isn’t the weekly PS Plus update) to see if they at least match the quality of Sleeping Dogs. At the very least, I’d hope they start adding PS1 and PS2 classics to get on the Vita if they cannot yet give out Vita-exclusive games. I understand that, being a new console, it may not have enough games to be given out for free. But there is absolutely no reason not to release PS1/PS2/PSP classics for the Vita at the very least. I would grab this deal but my ISP sux and d/l’ing full games is too dang slow!! I will definitely stack this deal onto my current membership. Just please improve the PS+ content! Yes, thank you for point this out man, I didn’t see it until now, I had to read it fast as i’m currently in class. I jumped on this deal a couple of days ago. I’ve been subscribed since the first month and i’m absolutely thrilled with the service. Like a few have posted, I bought ps plus last week. Any chance that all January adopters will have this extended to them? Keep up the great work! @24 no problem dude we all make mistakes lol and I’m in class too how coincidental. I am also excited to see what we get Im hoping for something Vita related but I won’t hold my breath lol I’ll be content with a good PS3 title. DO NOT PÀY FOR THIS PEOPLE!! I KNOW ITS JUST $50, BUT I EARN MY MONEY AND I DONT LIKE TO WASTE IT!! Hey, give us Sleeping Dogs like the PS Plus Europe!!! I bet we’re getting a PSN game that has DLC for sale. Great offer! I’m wishing I hadn’t just recently renewed…. What I’m really wishing for though, is that this month’s PS Plus offerings are identical to what Europe is getting with Sleeping Dogs and F1 Race Stars! You should’ have offered this deal back in December when the subscriptions of those people that have been on PS+ since day one were up for renewal. when are we getting Resistance 3, Motorstorm Apocalypse or Ratchet and Clank A Crack in Time on the ps3? Resistance Burning Skies, ModNation Racers Road Trip, Escape Plan or Rayman on the psvita? anyways are we getting Ratchet and Clank Full Frontal Assault on the vita tomorrow? has it been delayed again? any new info on Killzone Mercenary, Tearaway, Soul Sacrifice, Tearaway? Nice. My PS+ Ends on Feb 9. I Love it. Keep the awesomeness coming Morgan. This is just something I need! Thanks for the awesome work here PS. To the Vita owners: Stop blaming Sony for the fact that the console doesn’t have more then 5 or 6 great games, every new console suffers that on the beginning. Now that the PSN web store is up, why not link to this deal directly? Lmfao this is a trap. Never signing up for + again. @Fardeenah – Honestly is it necessary that you put the EU update on here. I mean really? we can look that up ourselves and the people that really compare the two do it themselves anyway. This isn’t even the actual plus update just a promotion deal. – Buy one year get 3 months free, not bad deal if plus works for you. on the fence if I’m going to even renew still early in it so I’m just like ehhhh pass. It’s stack-able y’all and for the code questions, I’m thinking just when you put in the code during this time period for a one year then you can get the 3 months. This is great, Thank you Sony! My membership is set to expire in early March, so this is a great time to renew. I almost renewed about a month ago, but now I’m glad I didn’t. @43, You did the right thing, with all the free games and discounts you get through Plus, the membership pays for itself in a month or so. I have some great games there that I probably never would have discovered otherwise! @ likeanobody The vita definitely has more than 5 great games. It’s just that some people are ungrateful or don’t wanna buy the games they want.